Why you should NOT whittle your stick over your boots. Last night I decided to whittle my next seasons 'stang', something I generally like to do around the Celtic Samhain festival. However last night the need to whittle was a reaction to my utter frustration at the last couple of days computer usage. The horrible impact of the dark sorcery arts of Microsoft wizardry casting their computer spells through forced updates upon my computer. These enforced updates have caused misery, havoc & chaos, deleted programs, made files inaccessible, programs crash & other such pain. I have had to create some very convoluted frustrating work rounds to complete what were previously very simple computer tasks. Curse you Microsoft. (NB: I hate Windows 10 more passionately, than I despise Windows 8, & I'm not impressed with that previous Microsoft regression & their utter aloof contempt towards their customers). In fear & trepidation each morning I turn on the computer to discover what will Microsoft no longer allow me to use my computer for - Windows Movie Maker already a casualty = no more simple slideshow creations & I, like many others on the inter-webbry cannot find a simple, 'emphasis on simple', program to replace it. So last night I decided to strip the bark & whittle my 'stang'. It is a satisfying, but messy process. Strips of bark & wood shavings cascade under the blade as I like to relax, kick off my boots & watch/listen to television whilst stick whittling. Each year I have a new staff (stave, rod, stang). During August - September whilst out walking Tik-ma-dog I start casting my eye over suitable branch growth before the Autumn. You would be surprised how difficult it is to find just the right long, straight-ish & forked length of growth of both correct length & girth. I prefer an at least elbow high stave-stang. By the end of the year it will have worn down by some 4 inches (10cms) or so through usage. 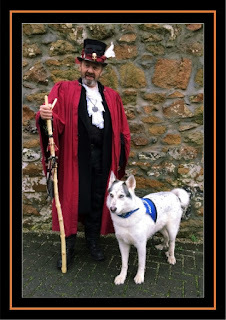 Tik-ma-dog & I tend to do a lot of solitary 'bimbling' (Navy slang) around the Cornish countryside & coastline. My preference is for Sycamore wood. In Cornwall, sycamore are sometimes referred to as 'weed trees'. They do pop up all over. It is sustainable, regrows quickly when cut, peels beautifully with a blade of its bark, leaving white wood (once scraped of pithy under bark). The wood then when seasoned for a week or two, rubbed down with wire wool & brown boot polish leaves a delightful pale honey glow to the wood. So last night I whittled. This morning after sitting at computer during 1st round check of ebay listings & etsy, twitter, tumblr, etc.etc. the sudden realization the clocks had gone back an hour. My computer had automatically reset the time. Which Is why my head was an hour out sat at the computer. British Summer Time first brought in during WWI & fiddled about still further during WWII (British Summer time, its just something we Brits do). Tik-ma-dog was now doing a minor River Dance jig at this stage so it was imperative to get her out for her walk. Rushing downstairs thrust my foot into my walking boot &..... well you get the general idea. Which is Why you should NOT whittle your stick over your boots!